The ship docks within easy reach of shops and cafes and there is also a couple of beaches either side of the marina which are easily accessible. Some larger cruise ships may anchor and tender you ashore. Ancient fishing harbor becoming seaside station, Propriano remains nevertheless a city with human size. Propriano is a Port situated in the Valinco Gulf on the French island of Corsica. The island's pleasant climate, beautiful mountains and breathtaking coastlines make it a popular destination among the French and other Western Europeans. However, the island has not had the same level of intensive development as other parts of the Mediterranean and is thus relatively unspoiled. The town is small, perhaps less populated than most cruise ships it welcomes. The main street runs around the marina, with some shop but many restaurants overlooking the marina and bay. As the restaurants and cafes mostly cater to the many yachts, prices tend to be high. There are just a few taxis in town and no local tour guides offering their services. Unless you take a ship organized tour, you best bet is to head for the pebbly beach with few facilities, or spend the day at the pool deck of your ship. 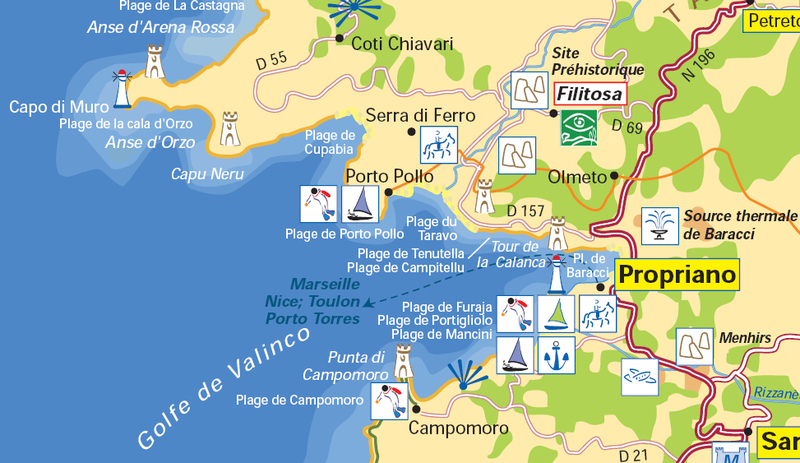 Visit the ‘most Corsican of Corsican towns’ – Sartene. This Medieval village is set on a mountain ridge, so the views are pretty impressive. And the town’s cobbled streets are home to lots of great sights, like the Spina Cavallu Bridge, which dates back to the 13th century. A taxi or cruise organized tour might be the best way. Only a very few restaurants offer WiFi, try Bellevue on the main street.